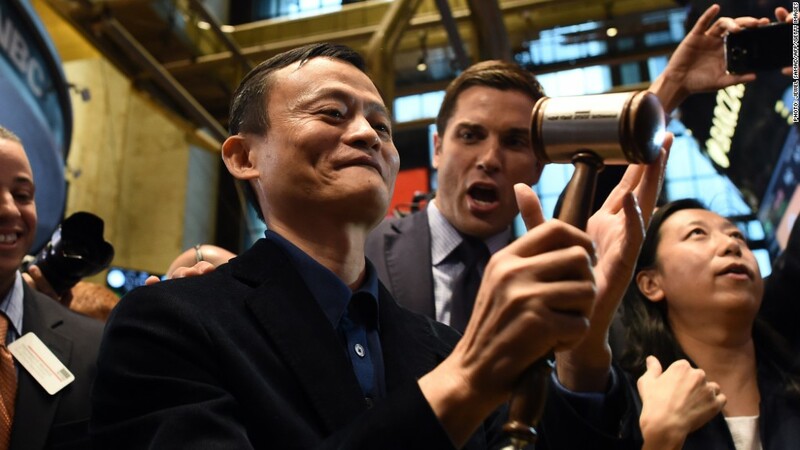 Alibaba founder Jack Ma rang the bell at the New York Stock Exchange on September 19, 2014 as his company celebrated its record-breaking initial public offering. The man behind the world's biggest IPO wants a do-over. Jack Ma is co-founder of Alibaba (BABA), the Chinese e-commerce juggernaut. Ma said life was difficult for Alibaba even before his company shattered records with its stock market debut in September. "Now, after the IPO, it's much worse," Ma said Tuesday in a speech hosted by the Economic Club of New York. "If I had another life, I would keep my company private," the Alibaba founder and executive chairman said. Ma's comments are sure to raise eyebrows, especially because they come less than a year after Alibaba (BABA) raised a record $25 billion by going public on the New York Stock Exchange. Like many companies that go public, Alibaba has faced extra scrutiny from investors, regulators and the media now that it's playing on a larger stage. "It's not only our people that watch us, the globe watches us. You have to get used to it," the Alibaba founder said. Alibaba is struggling: So far, investors don't love what they see. Alibaba priced its IPO last September at $68 a share. That valued the company at an eye-popping $168 billion, more than triple eBay's (EBAY) valuation at the time. Investors were so hungry to get a piece of Alibaba that the stock opened at $92.70 the next day. However, the bar may have been set too high for Alibaba. The stock is trading below $88 today, meaning many investors who bought on the day of the IPO are sitting on a loss. Alibaba's shares tumbled in January after reporting results that failed to meet Wall Street's lofty expectations and regulators in China knocked the company for failing to control an influx of counterfeit and pirated goods. More recently Alibaba's shares have rebounded as investors cheered results that beat forecasts and the company promoted chief operating officer Daniel Zhang to become its new CEO. Rejected by Hong Kong: Ma didn't hide the fact that New York wasn't his first choice for an IPO destination. Asked why Alibaba listed in America, Ma said: "We were rejected by Hong Kong." Alibaba scrapped plans to list in Hong Kong because the exchange there didn't approve of the company's governance structure, which gives Ma and other partners firm control of the board. What's ironic about Ma's wish for an IPO do-over is that it's unlikely to have commanded such a wide audience if Alibaba had listed in Hong Kong or stayed private. Alibaba targets American small businesses: Alibaba is setting its sights on luring American small businesses to the e-commerce site as a way to sell products to China's rising middle class. "We show great respect for eBay and Amazon, but I think the opportunity and strategy for us is helping small businesses in America," Ma said. "We need more American products in China."